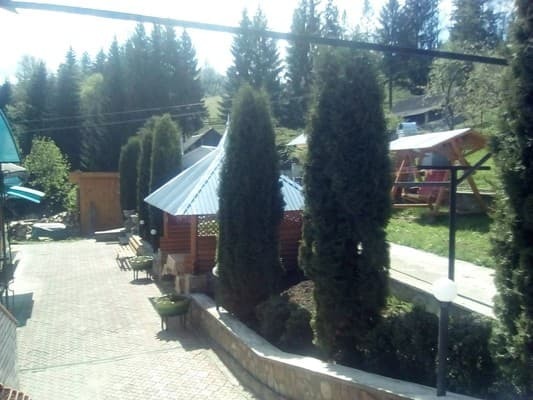 Guest house "Manor in Vlasiy" with free Wi-Fi is located in the middle of the Carpathians in the village of Putila, Chernivtsi region. It offers comfortable rooms, a place and barbecue equipment, a swing, a gazebo, a parking place and a garage. All rooms at the Guest House in Vlasiya guest house have wooden clapboards on the walls and ceiling, all rooms are equipped with flat-screen TVs. Guests share a bathroom (bath, shower, washbasin, bidet, toilet). All rooms have mountain views. There is a common terrace for two rooms. 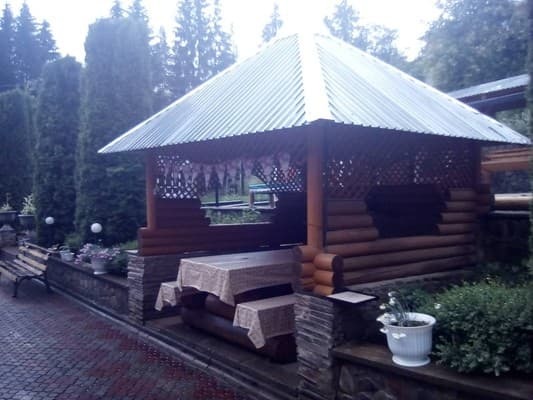 On the territory of the guest house "Manor in Vlasiya" there are two swings, a gazebo which can accommodate up to 12 people. In the surroundings you can go hiking. 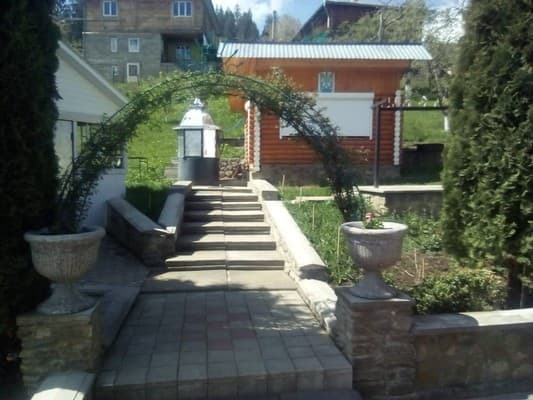 The owners of the Manor can organize excursions with their transport to the menagerie (village Selyatin), to the mountain Tomnatic (former military base "Pamir"), to the lake "Mountain Eye", etc. for a fee. Description of the room: Room with a large twin bed (possible + 1 child), flat-screen TV, two bedside tables and two racks for things. Window overlooking the mountains. 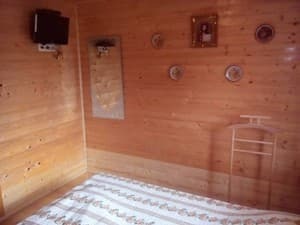 In the room there is a floor, a window, a bed, a door, a wall and a ceiling from a natural tree (walls and a ceiling are covered with a wicker). The two rooms have a shared terrace, a corridor, a kitchen (with everything necessary for cooking, food storage and a dining table) and a bathroom (bath, toilet, bidet, washbasin, ironing board, iron, clothes drying). 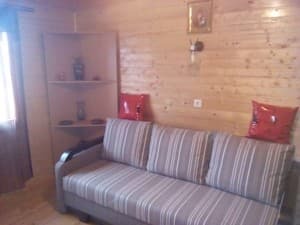 Description of the room: Room with a large double sofa (possibly + 1 child), TV 32d with flat screen, fireplace and closet for things. Window overlooking the mountains. The room has a floor, a window, a door, walls and a ceiling made of natural wood (walls and ceiling are lined with lining). 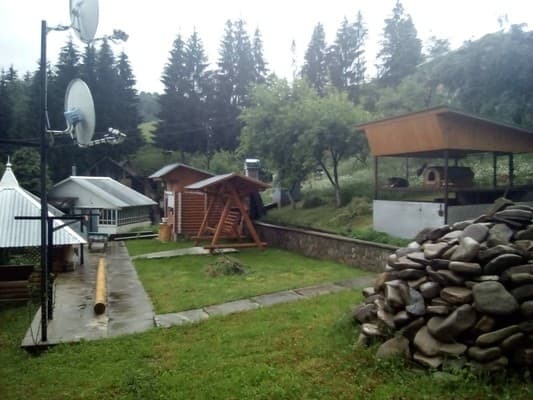 The two rooms have a common terrace, a corridor, a kitchen (with everything necessary for cooking, storing food and a dining table) and a bathroom (bath, toilet, bidet, washbasin, ironing board, iron, clothes dryer. Check arrival: from 12:00 - 22:00 hours. Check leaving: to 08:00 - 12:00 hours. Each room accommodates two adults and one child. Payment is charged per room. Extra beds are not available. 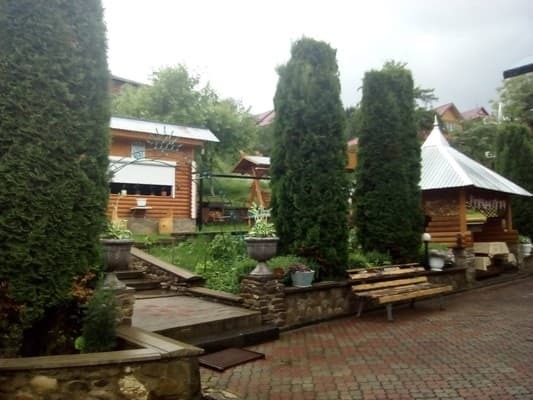 300 meters from the Manor is "Kolyba", where they cook delicious Ukrainian dishes and Hutsul national cuisine. 500 meters away is the restaurant "Party". Over 1000-1500 meters (the central part of Putila) - other entertainment and eating places. 59100, Ukraine, Chernivtsi region, town of Putyla, Ukrainskaya street, 252. By bus from the Central Bus Station of Chernivtsi. Buses run almost every hour.